It’s Sunday morning. The first thing my daughter asked to do this morning was “cakoo” or cook. 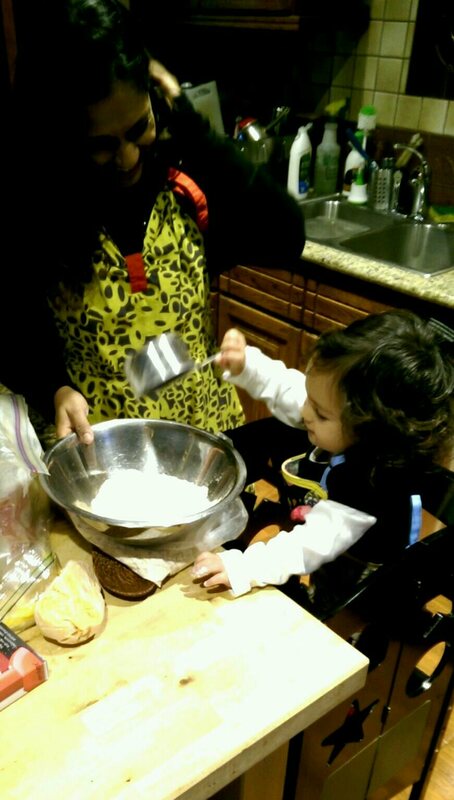 I am so thankful that this little one is a mini sous chef. I rarely eat waffles. 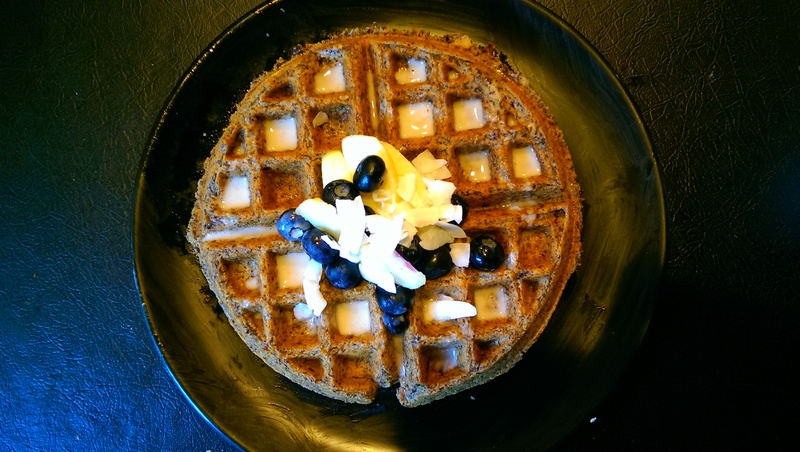 But of course, while on a whole food challenge, suddenly I am craving waffles. That meant I had to come up with something I could eat, that my family would enjoy as well. My first thought was almond flour. Rich in protein, sweet in flavor. But what if I incorporated flaxseeds to add some nutrition? Flaxseed has been around since early as 3000 BC and its health benefits have been known for a very long time. I read somewhere that King Charlemagne (Charles the Great) had passed laws in the 8th century requiring his subjects to consume flax seeds for their health. So what do we know now about flaxseeds? They are healthy for several different reasons, but the most important are the omega-3 essential fatty acids which are “good” fats. There are several kinds of omega-3’s and flax seed specifically has alpha-linolenic acid or ALA which is an essential nutrient – it is absolutely necessary in your diet. Best sources of omega-3’s for vegheads are flaxseed, chia seeds, hempseed, and walnuts, but there are others. DHA and EPA are omega-3’s but they are not considered “essential” because our bodies can make them from ALA (though I still take supplements for them). Flax is an amazing little seed because it can be used as an egg replacer which you can learn all about here. I will not be using it as an egg replacer. I want to add enough to my batter to make it rich in omega’s but also add egg for protein. Flax seeds have a hard outer shell, so they must be ground down in order for your body to access the nutrients, otherwise they are nothing but insoluble fiber. And once they are ground, they should be stored cold and protected from light to preserve the nutrients. You can buy whole flax seeds and grind them in a coffee grinder. Bob’s Red Mill sells an already ground flax seed meal you can find at Whole Foods or online. I also added canned fatty coconut milk to avoid boxed coconut or almond milk with sugars. I added a ripe banana for moisture and sweetness and chopped granny smith apple for a nice tart sweet flavor.I used a whole vanilla bean but if you would like to use extract, that would work, though I do prefer pastes to extract as the flavor is richer. I think this would be great with a compote or coulis on top, but I made a coconut, pureed date, orange zest topping to act as a “maple syrup” for the feeling of having something to dip into, rather than taste of maple syrup. You could potentially thicken the syrup up with arrowroot powder if it is heated up, but I didn’t mind the thinness of the “syrup.” I garnished with apple, blueberry and coconut flakes. I also added some crushed walnuts for extra protein. It was tasty, moist on the inside, crisp on the outside and hit the spot! And my family loved it. Beat the egg in a bowl and add, vanilla, banana, lemon zest, coconut milk, ghee and water and mix. 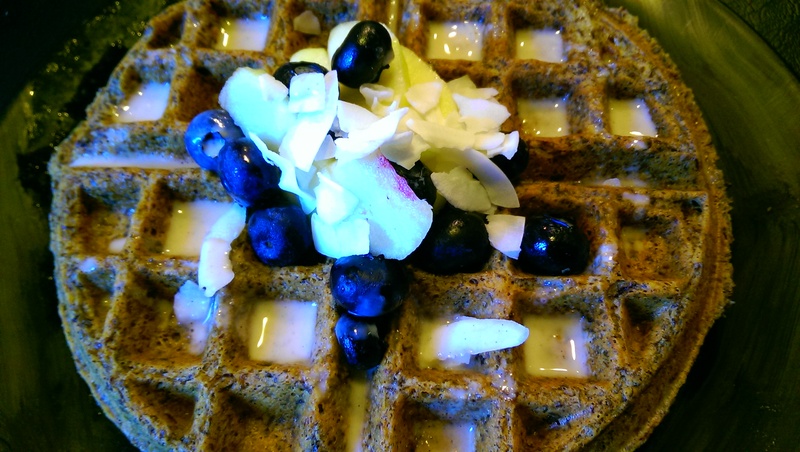 Line waffle iron with coconut oil and cook waffle. Top with shredded coconut, walnut and fruit. Add all the ingredients to a blender and mix.